At Dumond’s Custom Furniture, we’re proud to say that each piece of our custom wood furniture is meticulously hand crafted right here in the USA. Using beautiful and unique hand selected wood slabs from around the world, we build reclaimed wood conference tables like nothing you’ve seen before. Whether you decide to order one of the custom reclaimed wood conference tables for sale below or you decide to have a custom piece made to fit your personal style, you can rest assured knowing that your new furniture is built to stand the test of time. Natural edge 89″ x 46″ wide walnut crotch slab custom conference table. We carry a wide variety of executive tables and can custom build one to your exact specifications. Click the request a quote button below and find out more. Contemporary burl Claro Walnut executive conference table. Natural edged and cut edges, single slab burl Claro Walnut slabs make this beautiful executive table unique. The grain in the Walnut is amazing. The base is also built from Walnut. Contemporary burl Claro Walnut executive table. Natural edged and cut edges, single slab burl Claro Walnut slabs make this beautiful executive table unique. The grain in the Walnut is amazing. The base is also built from Walnut. The Custom Double Walnut Crotch Conference Room Table. Approximately 81″ long x 36″/66″ wide. 8′ Ash slab conference table with double Walnut pedestal base. Amazing grain on this table. Would look great in a home office or conference room. 4×22’ single walnut slab conference table with steel I-beam base. This table is SOLD but we have another identical slab from the same tree and could make another table that looks just like this one. Irregular Live Edge Walnut Conference Table with Walnut Base. Approximately 9′ long x 32/36″ wide. The Martins 5′ conference room table with organic shape and natural edges. This boardroom table features a book matched set of English Walnut from an exceptionally large tree. There are Ebony butterfly accents on its top. Unique live edge English Walnut conference tables made to order from unique natural edge and live edge wood slabs. The “Binder” walnut slab handmade conference room table with burled maple base. SOLD – But can make another similar table and have we have lots of unique solid wood conference room tables in stock. Find a wide selection of natural edge and live edge custom conference room tables made from reclaimed and recycled urban woods. 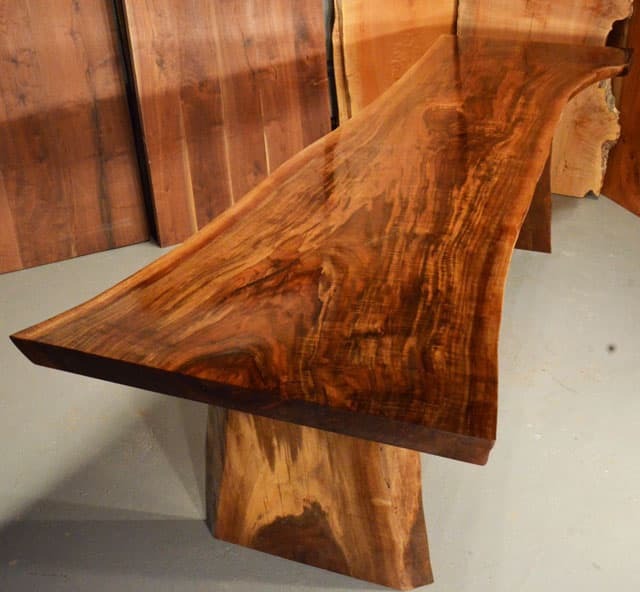 Organic shaped book matched Walnut conference room table. Bookmatched Walnut crotch conference table with natural edges and organic shape. Cherry and Walnut Custom Conference Room Table. This item has SOLD but we can make another similar table and we do have many large custom conference tables in stock. Custom Curly Cherry Crotch Slab Conference Room Table with Walnut Pedestal Base. Approximately 8′ long x 58″ wide. Bookmatched Cherry Custom Dining Table with Walnut Slab Base. 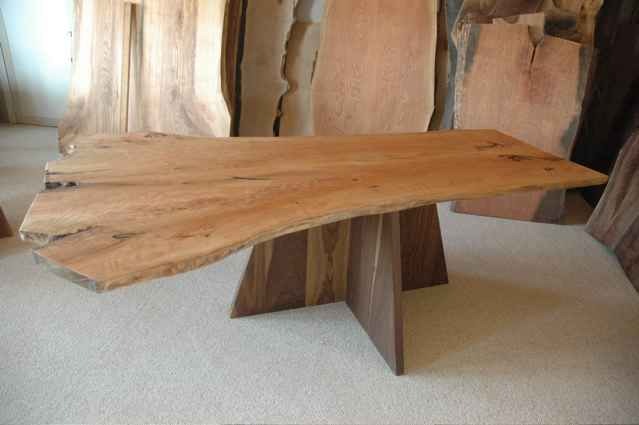 This table features a Claro Walnut top from an exceptionally large tree. Rustic conference room tables made to order from unique natural edge and live edge wood slabs. If you’re looking for a custom built reclaimed wood conference table to fit your home or office space, we can help you out! Let’s say you already have an idea in mind of a custom conference table that you would like to have. You can submit your idea to us via our Request A Quote Form or call us directly at (406) 777-3772.